By Jeff Clark, BIG GOLD : In early July, Japan set a premium price for solar energy that was three times the rate of conventional power. This meant utility companies would be paid three times more for electricity sourced from solar. It's widely expected that the premium will ignite the use of solar power – and solar uses a lot of silver. As you may know, silver is used in photovoltaic (PV) technology to generate solar power. A typical solar panel uses a fair amount of the metal – roughly two-thirds of an ounce (20 grams). To put that in perspective, a cellphone contains around 200 to 300 milligrams (a milligram weighs about as much as a grain of sand). A laptop contains 750 milligrams to 1.25 grams. 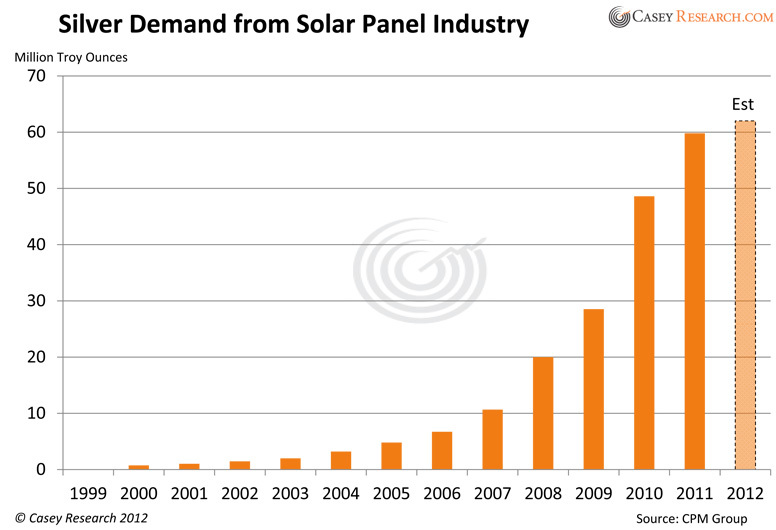 Photovoltaic technology is relatively young, but each year its use is growing rapidly. Just since 2000, the amount of silver consumed by solar-panel makers has risen an average of 50% per year. Demand grew from one million ounces in 2002 to 60 million ounces in 2011. Last year demand from the PV industry represented almost 11% of total industrial demand for the metal (excluding jewelry). According to statistics from CPM Group, demand grew by 11.2 million ounces, the strongest volume growth of all major sources (jewelry and electronics). And this was before the Japanese announcement was made. The largest end-user of solar panels is Germany, though that's changing. Last year Germany accounted for 27.3% of global installations, but due to subsidy cuts, solar-panel installation capacity dropped from 7.7 gigawatts to 7.5. In the big picture, that decline was offset by increases in China, France, Italy, the UK, Japan, and the US. In their 2012 Yearbook, CPM projected a slight decline in silver demand from solar panels due to a reduction of new installation in Europe and oversupply from excess production in China. But with the initiative from Japan, that estimate is almost certainly low. After the Fukushima disaster, Japanese authorities wanted to cut the nation's dependence on nuclear energy. Approximately 30% of Japan's power was generated by nuclear before the catastrophe; now the focus has shifted to other green energy alternatives, including solar. The new tariffs might work. The suggested rate of 42 JPY ($0.53) per kilowatt hour (expected to be maintained for 20 years) is more than twice the rate in Germany (€0.17 – or $0.246).Bloomberg estimates that this generous increase will create $9.6 billion investments in Japan alone. Here's what that amount of money would do to the sector: There were approximately1.3 gigawatts of solar capacity installed in 2011, but experts anticipate that number to nearly double to 2.3-2.5GW for 2012, and hit 3.0GW in 2013. According to SolarBuzz, Japan could see 28GW of solar capacity installed by 2020 and 50GW by 2030. That's a lot of solar panels, and – even assuming improved efficiency – it'll take a lot of silver. For a long time, silver industrial demand was dependent almost entirely on one industry: photography. Silver-based camera film dramatically changed the structure of silver demand at the beginning of the 20th century. By that time, silver had primarily been used in silverware, jewelry, and as money. At its peak, photographic demand accounted for about 50% of the market. But this is the 21st century, and in spite of substantial declines in film use, the modern world has developed many other important uses from silver's unique properties. Probably the most important shift is that industrial demand for silver no longer comes from a single field, but from numerous applications – almost too many to count – virtually none of which show any signs of slowing. This fact makes the forecast for silver demand more positive and stable; when one industry drops, others may offset the decline. Solid-state lighting (SSL), which uses semiconductors to produce light with either light-emitting diodes (LED) or organic light-emitting diodes (OLED), rather than the more traditional electrical filaments. SSL is used in traffic lights and some car headlamps. Radio frequency identification (RFID) uses printed silver ink made from silver nitrate. RFID chips have become so ubiquitous, it's hard to find any new product that doesn't have at least one – even if that's only in the security tag affixed to the package. Supercapacitors and superconductors, autocatalysts and new types of more effective batteries. Medical applications like aseptic coverings for surgery, traumatic wounds, antibacterial bandages and fabrics, dental amalgam, and silver salts that help prevent infections in newborns. It's also used as a cure for dermatological problems and certain types of cancer. Water purification systems, washing machines, air conditioners, and refrigeration. NASA used silver to sterilize recycled water aboard the space shuttle. Food packaging and preservation. Manufacturers of commercial ice machines are using silver-embedded hoses, clamps, pipe fittings, and other places where gunk can build up and harbor bacteria. Meat processors use silver-embedded tables, grinders, tools, and hooks. Silver is used to keep fruit, vegetables, and cut flowers fresh while in transit. Public hygiene, such as antimicrobial protection of telephone receivers, door handles, bed rails, toilet seats, counter tops, children's toys, socks, underwear, bed linen, towels, etc. Other wide-ranging consumer products used every day: makeup, antibacterial soaps and kitchenware, hand and air sanitizers, and facial creams and masks. Though the total contribution from these new silver uses is relatively modest, the Silver Institute rather dryly forecasts that "there is a potential for a number of these segments to boost their silver consumption." 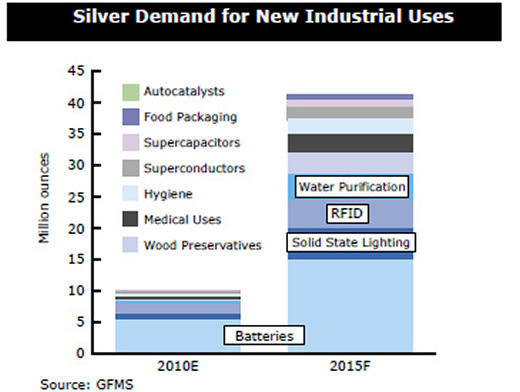 As you can see in the chart below, its forecast for silver demand for new industrial uses projects that the biggest increases will be in batteries, SSL, and RFID. The primary uses for silver are growing, too. For example, the automobile industry is increasing consumption, due to both increases in the number of vehicles manufactured and the expanded use of electrical contacts. As the number of improvements in vehicles increase, so does the amount of silver used. For example, silver is used to control seat and mirror adjustments, windshield wipers, and manage navigation systems. 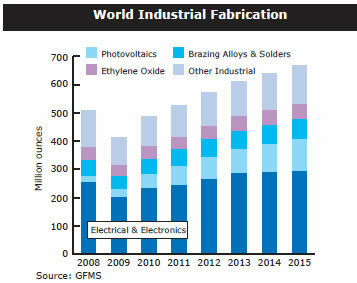 Based on their research, the Silver Institute forecasts that industrial usage will rise to 665.9 million troy ounces by 2015 and account for more than 60% of total fabrication demand. Since half of silver demand is for industrial purposes, it can act like an industrial metal in addition to its precious metal component. This means it's susceptible to more forces than gold, making it more volatile as well as more difficult to predict its future price. The solar industry has great potential to become one of the more important sources of silver demand. This will lend strong support to prices. 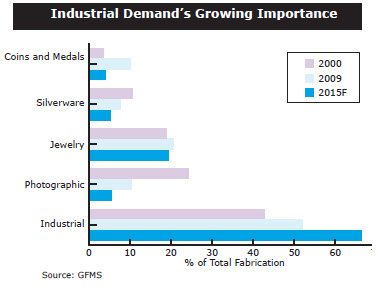 This industry had zero impact on silver ten years ago; it now represents 10% of total industrial demand. And it's not just Japan. According to a news report, 102 countries are now installing solar panels – from just 18 two years ago. Heavy and/or growing usage is reported in Germany, Italy, Japan, France, Belgium, Portugal, Spain, US, Australia, and Asia, including China and India. It appears that the development of the solar industry didn't occur as a result of natural forces, since to a large degree it was initiated by government subsidies that supported the industry (and indirectly the silver price). You may like or not like these market interventions, but as investors, it's important to recognize these trends regardless of whether we agree with them. It's particularly important to keep an eye on these subsidies, as they could vanish if cash-strapped governments change their priorities. That won't happen overnight, however, so we should have ample warning. Due to its unique properties, the number of applications for silver continues to grow. Researchers at the Silver Institute are upbeat about the future for silver industrial demand. That's no surprise, but it doesn't make them wrong; the implication here is that only the worst type of economy would have a negative impact on demand. If demand grows fast enough, it could impact not only the price but the availability of the metal, in spite of rising mine production. If that happens, bullion purchase premiums will rise as supply becomes tighter. The bottom line on the above is that the growing number of industrial applications for silver represents a long-term shift in this market. Increasingly diverse usage is not only here to stay but will continue to grow, supporting the price and impacting the balance of supply and demand. For investors, the thing to keep in mind is that while long-term prospects for silver prices are extremely bullish, to the degree prices are driven by this increased industrial demand, they are vulnerable to economic correction/contraction in the short term.